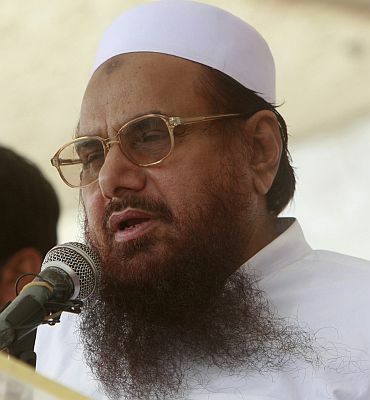 A Pakistani court has asked the Punjab government to explain under what authority it has detained Jamaat-ud-Dawah chief Hafiz Saeed "without a trial". A Lahore high court's two-judge bench headed by Justice Syed Kazim Raza Shamsi was hearing a petition of Saeed, his aides -- Prof Malik Zafar Iqbal, Abdur Rehman Abid, Qazi Kashif Hussain and Abdullah Ubaid -- who had challenged their detention under the anti-terrorism law. After hearing the arguments of advocate AK Dogar, counsel for Saeed, Justice Shamsi observed the government should tell about its powers to detain a citizen like Saeed without trial. Referring to an Indian movie wherein Saeed was portrayed as a villain, the judge said the government should see if there is any "international conspiracy" against Pakistani citizens. Dogar concluded his arguments saying the government had detained the JuD leaders without any justification. Dogar also questioned the powers of the provincial government to include any citizen in the fourth schedule of the Anti-Terrorism Act. He said such powers were solely vested with the federal government. He said the government had detained him (Saeed) and others to please India and the US. He further argued that the UN resolution followed by the government action did not seek detention of any citizen. He said the detention of the JuD leaders is a case of mala fide intention and ulterior motive on part of the government. Dogar said the government had no evidence that the petitioners were a risk to security of Pakistan, and merely on the basis of UN resolutions their liberty could not be curtailed. The government on January 30 had put Saeed and the four leaders of JuD and Falah-e-Insaniat under house arrest in Lahore under the country’s anti-terrorism act. The court adjourned the hearing till April 4.